Lol Tolhurst,drummer/keyboardist and co-founding member of The Cure, is releasing his memoir Cured: The Tale of Two Imaginary Boys on October 11th. 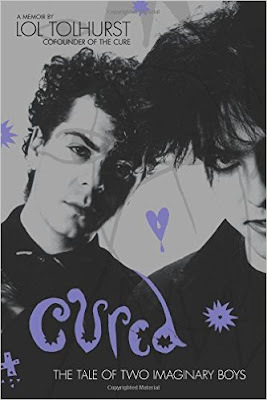 The memoir is a must-read for any Cure fan -- Tolhurst's book is the first "insider" account of the Cure's early days, and is filled with revealing stories about his friendship with Robert Smith, the evolution of the Cure, and his personal struggles with battling alcoholism. Cured: The Tale of Two Imaginary Boys is available to pre-order now. Fans should consider pre-ordering through Pledge Music, as the campaign is funding Tolhurst's upcoming book tour. Dates for the book tour are posted below. Note: according to Tolhurst, a few other cities will be added soon, including stops in Chicago, Dallas, and Nashville among others.